Q. Can I use the Spray Tank Cleaner on any part of the sprayer, or just the tank? A. Spray Tank Cleaner can be used on all parts of the sprayer, including the tank, hoses, pumps, valves and nozzles. Q. My sprayer is an older version that hasn’t been cleaned in a while. Will Spray Tank Cleaner still help clean it? 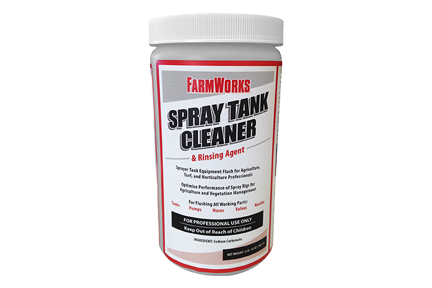 A. Spray Tank Cleaner can be used on sprayers that have been standing a long time or are exceptionally dirty; however, additional time may be needed for the product to clean the buildup that has occurred in the tank. Also, you should be aware that when tanks are corroded, leakage may occur after using the Spray Tank Cleaner due to rust removal. Q. I used Spray Tank Cleaner and now my sprayer leaks. Did it eat through my tank? A. Spray Tank Cleaner does not attack steel, aluminum, brass or other materials, but it will remove the rust that was likely temporarily sealing the tank. Q. How often should I clean my tank with Spray Tank Cleaner? A. Spray Tank Cleaner should be used when changing chemicals in your sprayer or to clean your sprayer if you are finished using it for the season. Q. Can I use Spray Tank Cleaner after having any product in my sprayer, or do I need to prep it first? A. Spray Tank Cleaner can be used to clean the sprayer for any product that is registered to be mixed in your tank. Special precautions should be followed after using 2,4-D. Be sure to read and follow the label directions. Q. I just cleaned my tank with Spray Tank Cleaner and now I want to use a new chemical. Is there anything special I need to do to prepare my sprayer? A. If you are changing chemicals, a second rinse is recommended with 25 gallons of water. Q. I just sprayed with 2,4-D. Do I need to use Spray Tank Cleaner in a particular way? A. There are certain parts of the sprayer, such as hoses, rubber connections, pumps and hand gun packing that are more likely to retain 2,4-D than the tank, boom or metal parts. In order to properly clean 2,4-D from these parts, be sure to flush them. Follow label directions to make sure your tank is properly flushed and cleaned. Q. What is the recommended rate for using Spray Tank Cleaner? A. One package of Spray Tank Cleaner can clean up to a 200-gallon tank. Follow the label’s use rate chart to ensure you use the correct amount of concentrate and water to properly clean your tank. Q. What’s the best way to store Spray Tank Cleaner? A. You should store Spray Tank Cleaner in its original container in a dry place. Q. What do I do with the water I drain from my sprayer when I use Spray Tank Cleaner? A. There are no disposal requirements for Spray Tank Cleaner in its original state; however, once used, the solution must be disposed of according to the directions of the chemical you are cleaning from your tank. Q. How do I make sure I’ve done a good job cleaning all parts of my sprayer? A. Closely follow the label directions to ensure you have properly cleaned all parts of your sprayer. If you are changing chemicals, rinse a second time with 25 gallons of water. Q. Will Spray Tank Cleaner harm my pets if they drink from a puddle of the tank drain water? A. Spray Tank Cleaner will not harm your pets, but the chemical you are cleaning from your sprayer may have adverse affects for them. For safety purposes, keep pets away from puddled water that may exist in the cleaning area. Q. Do I need to have on my protective wear when I use Spray Tank Cleaner? A. Goggles and rubber gloves should be worn when using Spray Tank Cleaner. For complete safety measures, consult the label. Q. Can I recycle my Spray Tank Cleaner container? A. The Spray Tank Cleaner container can be rinsed and recycled.